SomewhereWarm	is ready to help you get the answers you need. SomewhereWarm	will reply to your questions about Get extension name	shortly. We appreciate your feedback about your support experience with SomewhereWarm, developers of Product Bundles. This helps us maintain high standards on the WooMarketplace, and helps SomewhereWarm improve. Glad to hear it went well with SomewhereWarm. Tell us more. Did SomewhereWarm get back to you? Do you have any additional feeback for us or SomewhereWarm? Product bundling is one of the most effective marketing strategies around. Bundle a few products together, offer them at a discount, and watch your sales soar! But bundling is not all about boosting sales — product grouping is also essential for creating product kits and assembled products. Product Bundles is a flexible product grouping toolkit suitable for use in a broad range of applications, thanks to its advanced grouping, pricing and shipping features. Need a way to combine multiple inventory-managed components in configurable bundles? There’s little Product Bundles can’t handle! Adding a bundle to your catalog is probably the most straightforward way to offer a few related products together. To make the offer more appealing, you can discount the entire package, or individual items. Encourage customers to purchase multiple, related products with one click: Add Frequently Bought Together recommendations to any product and sell more by offering optional items in existing bundles. Build assembled products using multiple inventory-managed parts and control the visibility of each bundled item in the single-product, cart/checkout, and order/e-mail templates. Create fully assembled, partially assembled, or unassembled bundles. Every bundle you create is a standalone product that you can show or hide in your catalog. 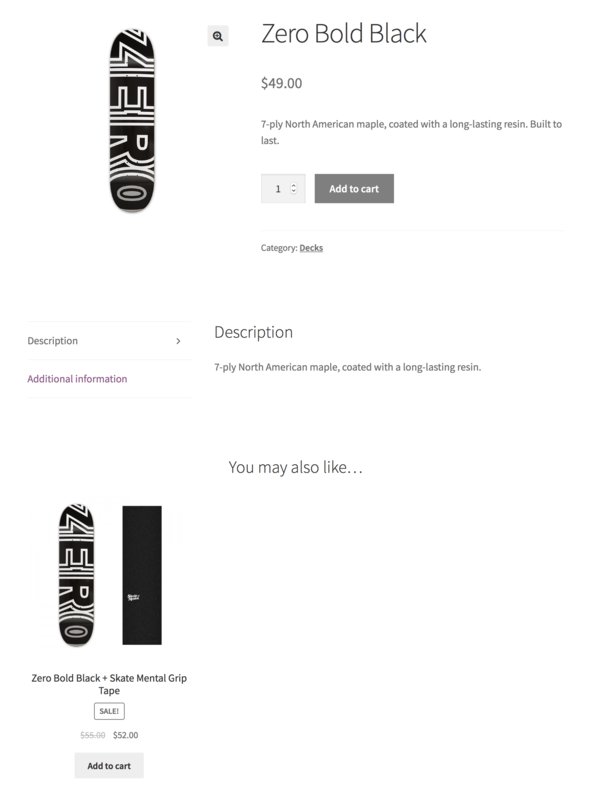 This allows you to utilize existing WooCommerce features — such as shortcodes and Up-Sells — to help customers discover them in a way that’s best suited to each use case. Add simple, variable and subscription products to bundles, including virtual and downloadable flavors of all types. Create digital and downloadable bundles. 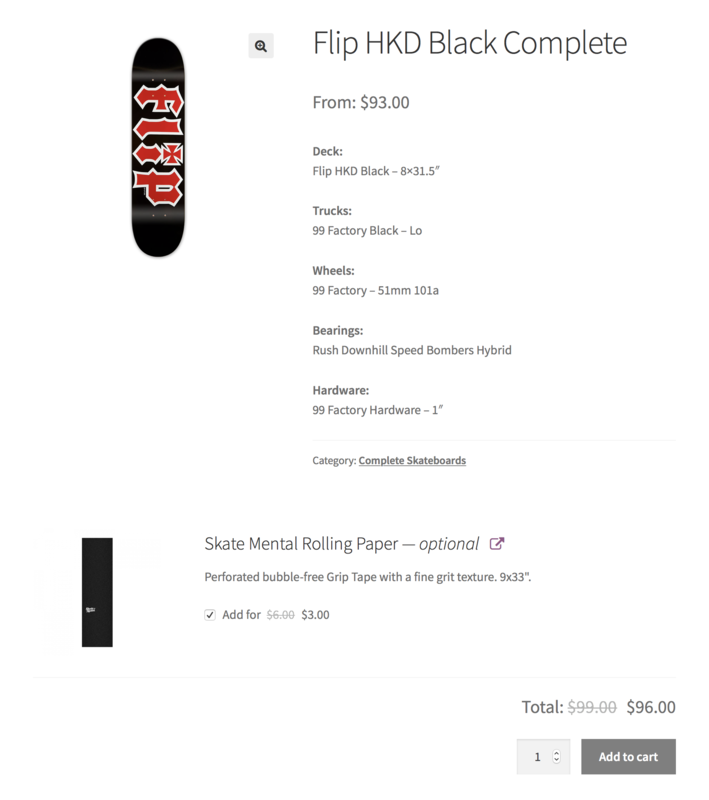 Control the pricing and shipping configuration of each bundle down to the last detail. 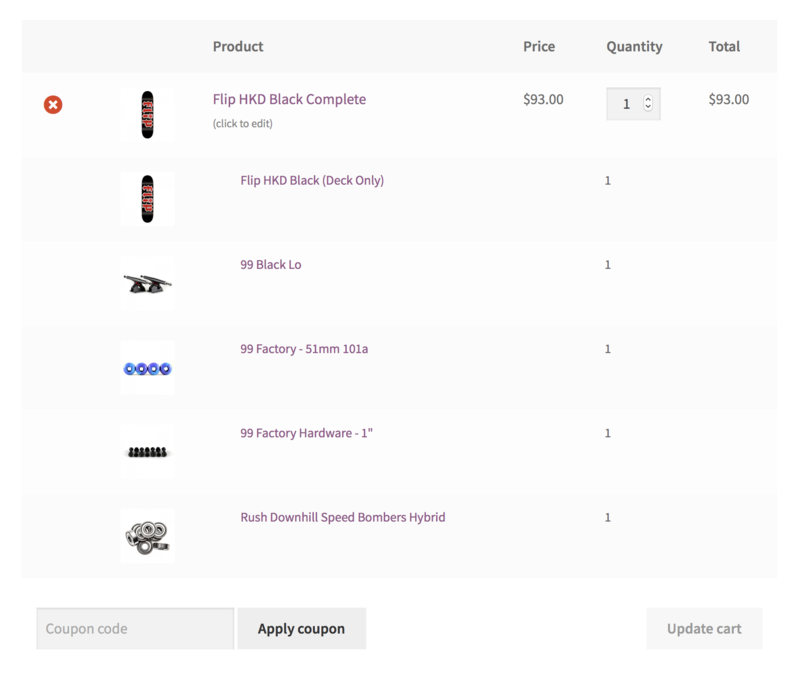 Build customizable bundles with configurable quantities and optional items. Managing a large store? Use bundled product stock reports to find bundles with insufficiently stocked contents. 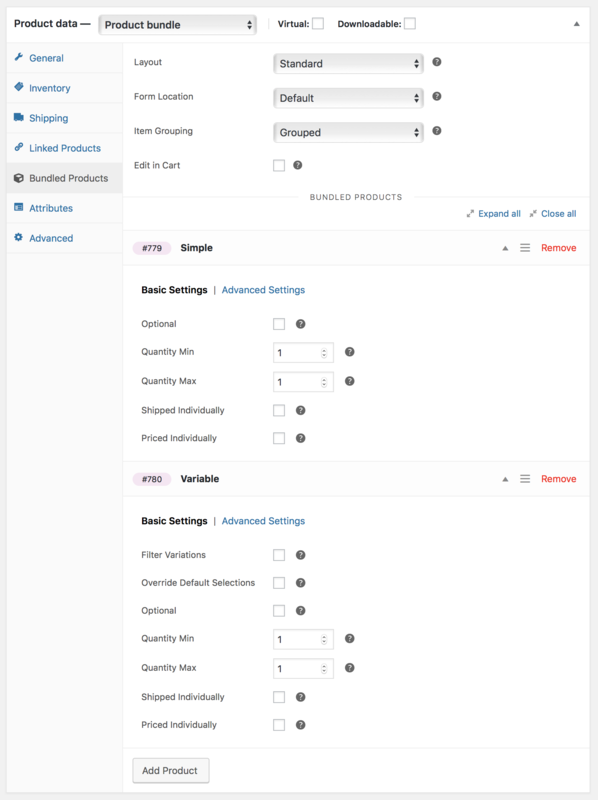 Tweak the appearance of bundles and bundled items in single-product, cart/checkout and order/e-mail templates. 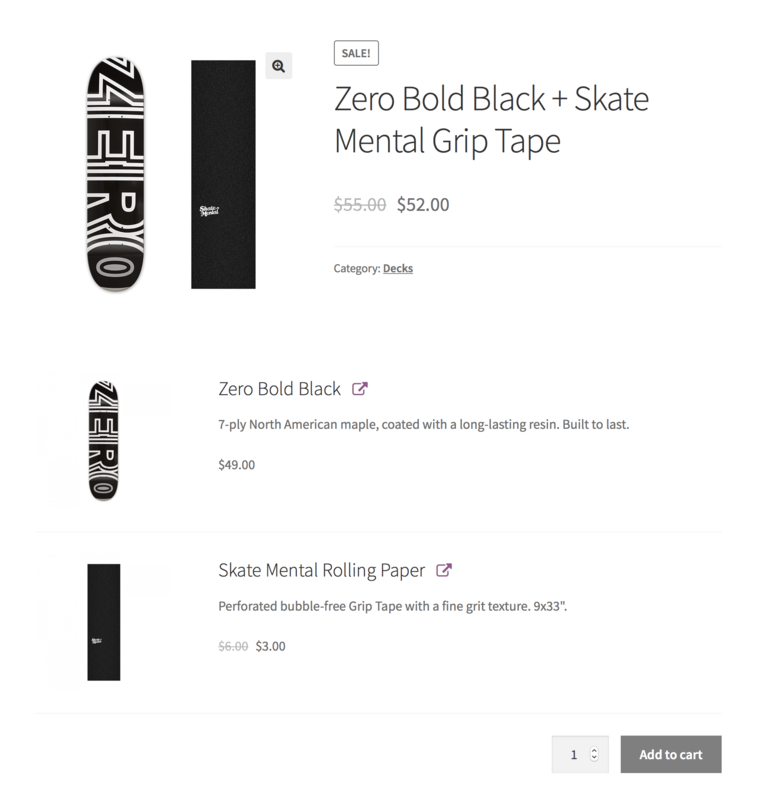 Planning to use Product Bundles with Subscriptions, Product Add-ons, Composite Products, Name Your Price, or One Page Checkout? We got your back! Customize it. Check out our growing collection of free snippets and mini-extensions for quick customizations and enhancements. Extend it. Looking for REST API support? Need a generous amount of filter/action hooks at your disposal? How about a comprehensive technical documentation? Is Product Bundles right for you? Product Bundles is suitable for creating product packages with static content: All bundled products are pre-defined, and customers may only configure quantities and attributes, or pick from a list of optional items. If you want to build product kits that consist of several components with multiple product options, then Composite Products might be a better choice. 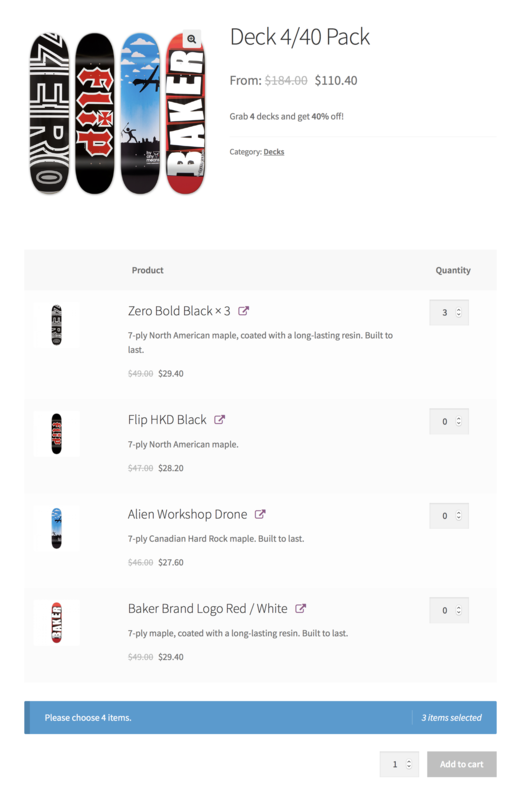 WooCommerce provides even more ways to sell products together, such as Grouped Products, Chained Products and Force Sells. Can’t figure out which extension is right for your store? We’ve written a handy comparison to help you decide.